Learning and laughing, I had a great time at WIA. Here are a few snapshots with preceding captions. A few closing thoughts follow the photos. 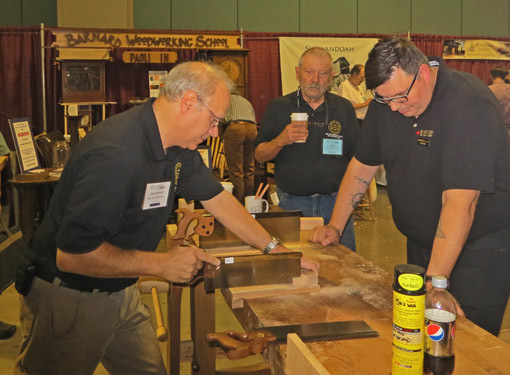 I spent much of the weekend hanging out with Mark Harrell of Bad Axe Tool Works, here demonstrating one of his superb backsaws. Looking on are Vic Tesolin of Lee Valley and Al Flink, a student of Mark’s who became my saw filing teacher for an afternoon. In the world of saws, BATW is playing chess while most are playing checkers. The same goes for shooting boards and Vogt Tool Works. Tico has added to his line of inclined shooting boards with models designed specifically for new shooting planes available from Lee Valley and Lie-Nielsen. If you don’t already own a Vogt shooting board, you owe it to yourself to check out Tico’s products. 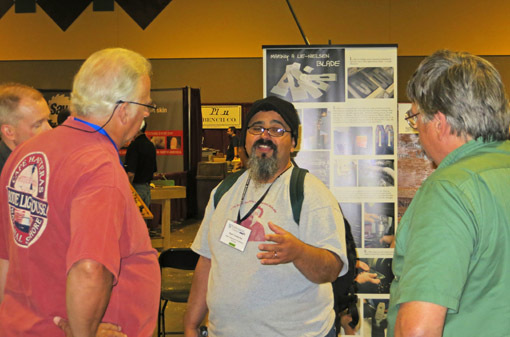 When Matt Vanderlist talks, woodworkers listen. Speaking of great communicators, I asked Marc Spagnuolo to look as cool as possible for this photo. Yes, I know, that’s like asking Kareem Abdul Jabbar to look tall. The Wood Whisperer met my request with his ready sense of humor. 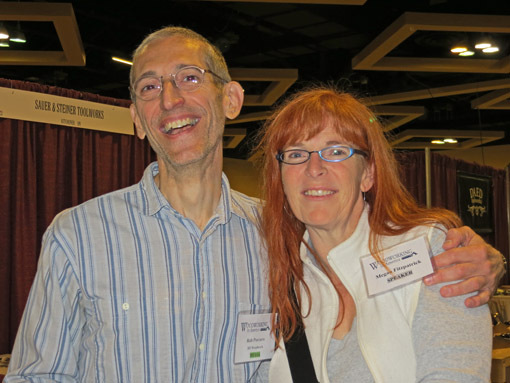 Popular Woodworking magazine Editor Megan Fitzpatrick and I, your devoted scribe, made a deal, or so I thought, to look as sappy as possible for this shot. Megan, no doubt quickly bringing to mind some Shakespearean plot, opted to appear quite levelheaded, while I succeeded rather spectacularly with the original plan – don’t you think? I will not reveal what Chris Schwarz did moments before this shot, but only say that he switched the anatomical focus of his jocularity from his customary posterior to anterior just in time for the photo. (No, he’s not adjusting the square on his shirt.) Can you tell that Deneb Puchalski and Tom Lie-Nielsen are covering for Chris with forced laughter? Seriously, it is hard to appreciate the beauty of the Lost Art Press books until you handle them in person. The same is so for the grace and functionality of Lie-Nielsen tools. Recognize the guy in the middle? 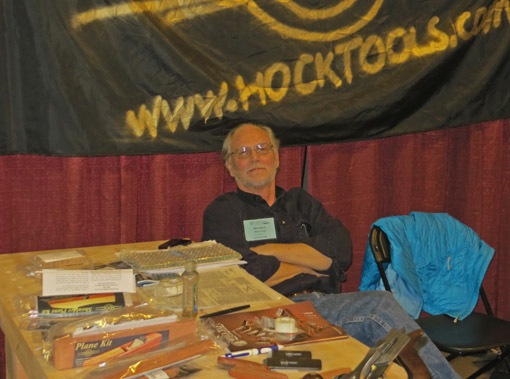 Ron Hock of Hock Tools has done so much for woodworkers for many years. 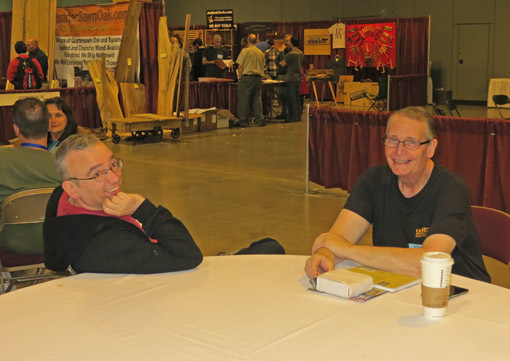 Woodworkers are similarly grateful for the contributions of Joel Moskowitz of Tools for Working Wood and Gramercy Tools, here chatting with Fred West. 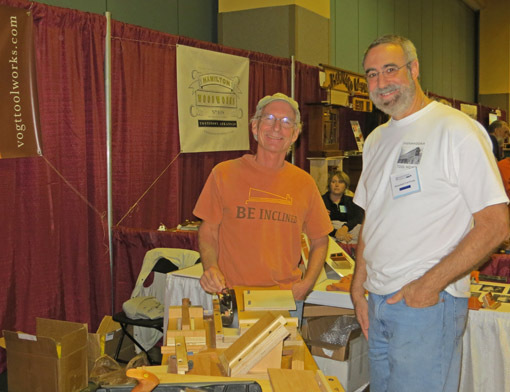 It was wonderful to be around so many people who love what they do, in this case, woodworking. The joy was palpable and contagious, while the learning flowed naturally. 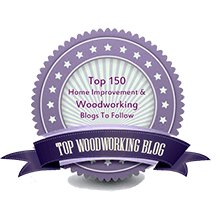 The direct link between action and result inherent in the craft of woodworking punishes pretension, so the down-to-earth nature endemic among woodworkers comes as no surprise. I am grateful for the many conversations I was able to have with sincere, masterful makers. 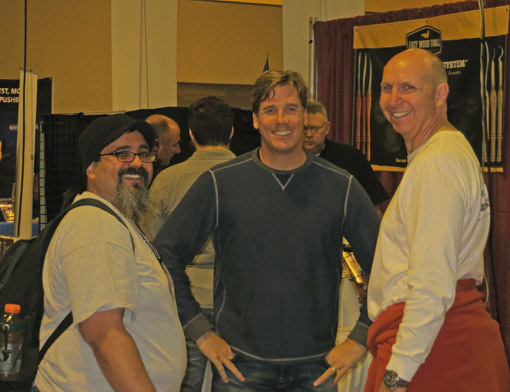 Some that I especially savored, such as with Mark Harrell of Bad Axe Tool Works, and Robin Lee of Lee Valley Tools, were alone worth the airfare. Thank you also to the many people whom I met who kindly mentioned their appreciation of my writings. 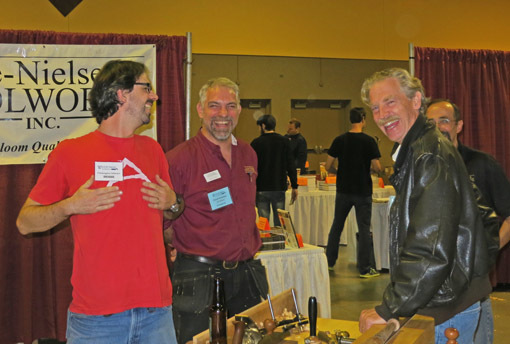 Special thanks to the Popular Woodworking crew for putting on a wonderful event! Thanks for the post Rob and the great pictures. Glad we had a chance to chat a bit and to finally shake your hand. 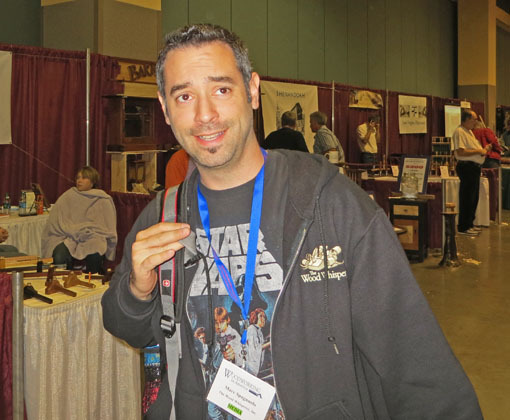 I had a great time there and especially working in the Bad Axe booth.